This computer is lame. And like a lame horse; it's going to the knacker's yard and I'm going to buy myself a new one. Well I've got a lot to say so I'd better get cracking (I was going to post yesterday but my computer's been struggling against the new anti-virus I installed). Ahhh! It's so nice to see friends! I mean, I don't really have any really good friends out here, and it's one of the things I miss most. I should get used to it, I'm sure you're not allowed to have friends (or fun) once you graduate. 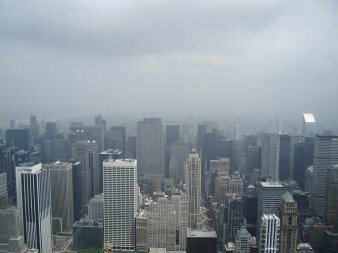 It was taken looking north, towards central park, not that you can tell from the picture. I like it, the whole thing looks really desolate. It looks like a really lonely place (although in reality it's bustling with people). Soo films. We saw Madagascar which was actually better than I thought it would be (I assumed that it would be rubbish). Some of the humour was heavy handed, but then, it is a children's film. But it was quite funny over all and even better because it was set in New York and we could recognise all the places they went to. We also saw Sin City. All I knew about it beforehand was that it was based on a graphic novel which my Dad reads. It's a very very stylised film, and while stylised is cool, I'm not sure if maybe they took it a bit too far. It's probably good, but I get the feeling that I wasn't the target audience. I'm not really interested in guns and girls and violence (well OK, maybe I do like a bit of violence in my films, but this seemed uncomfortably violent to me, and did the people doing the fighting have to be so ugly?). And I'm sure that the thing is supposed to be a barrel of cliches and that's why it's cool, but it seemed to be a bit devoid of plot, or anything to keep me interested. And then we saw a film that I was very excited to see...Howl's Moving Castle! On the first day it was out too (it's funny the people you see in the cinema on the first day...). So yes, it seemed similar to the other two studio Ghibli films that I've seen, in that it was really weird, but in a charming way. And also like the other Ghibli films, it seemed to have an ending at a random point that was kind of pulled out from nowhere (in my opinion), the whole cinema laughed at the ending...I'm sure they weren't supposed to laugh. It has funny bits (especially the witch of the west; 'what a lovely fire') and exciting bits and bits that looked great. And it had Howl in it. I'd heard people fangirling about Howl beforehand although I couldn't really see why, he seems bishounen for Ghibli, but not super bishounen. And then I saw the film for myself, and it's all in the way he was animated...I can't really put my finger on how, but he came across as very charming, and vain, but mostly charming. Although his English voice did not suit him at all (I get put off when anime characters have American accents, because it's not set in America and I don't have one myself). Steve and I were not sure if Sophie's voice actor was actually English or not...I'm too lazy to look it up. If you think I'm done then you're in for a nasty surprise. There's more! I bought some new CDs for myself. I got 'Demon Days' by Gorillaz, 'X&Y' by Coldplay and 'Get Behind Me Satan' by the White Stripes (which came with a free T-shirt, which would fit someone three times my size). Out of all of them, the one I've been enjoying the most is Gorillaz, and I would go as far as to say that it's better than their first album. It's got a sound that I can't really put my finger on, but I really like it. At this current point in time, I'm really feeling the track 'Dare', it seems to strike some kind of raw nerve in me, I have no idea why. The White Stripes needs some more listening to, I think. It may have been the only track I'd heard before, but the first song 'Blue Orchid' seems to be the best on the album. It's always a bit of a shame when the first song is the best because there is no more to look forward to, but it is an awesome song, I'd play it really loud if I wasn't worried about the people in the apartment below me. The new Coldplay album also needs more listening to, so I can't really give an opinion. My first thoughts are that it sounds a tad more lively than their previous stuff, but then you listen harder and realise that you can still hear the Coldplay in there. Listening to Coldplay makes me feel sad. I sit back and think about the music I like. I used to really love Coldplay; I listened to 'Parachutes' almost non-stop for months after I bought it. Along with people like Travis and Badly Drawn Boy, I really liked music that was calm and sweet and melancholy but with a beautiful tune. And now I seem to prefer music which is more upbeat (eg. Franz Ferdinand, the Bravery, Kaiser Chiefs, Killers), something I can get really excited about, music that makes me want to dance. And I wonder if this is a change in the music industry or rather a change in me as a person. To sum it up; new Gorillaz - yes yes yes! I've talked about the new volume of xxxHolic in other places and I'm too tired to say everthing twice so I'll be brief. In this volume it stood out to me how much of a good person Doumeki is. He just seems to be someone who is genuinely good and will do the right things, and that makes me respect him. The pipe fox spirit is really really cute (really really!). There were some particularly nice chapter covers in this volume, especially the ones with Yuuko and Watanuki dressed up all Indian-like. I don't have anything particular to say about Fruits Basket, I just enjoyed it is all. I like Hatsuharu more than I thought I would, and I like his coat with the furry collar (in a very roundabout way, this reminds me that I should continue reading Loveless). Shigure gets more interesting (smiles all the time but no-one can tell what he's thinking? Sounds familiar...) and I like the way he deals with his editor. This brings me around to the final volume of Tokyo Babylon. I can't talk about this without loads of spoilers, so I'm going to try to cut it. Click on the read more at the end of the post to read it. At the moment I'm very excited, because Steve is coming to visit tomorrow. For a week! Finally! I can pretend that I have friends! Now a three day weekend is nice (even if I went into work for the tiniest amount yesterday), but it's put me all out of sorts. I have no idea what day it is any more! At the moment it seems to be a cross between a Monday and a Friday, not the best combination I'll agree (perhaps I'll just call it Fronday and have done). Also, work this week seems like it's going to be kind of empty. I left at 4pm today and feel guilty about it, this feeling guilty is a habit I need to grow out of before I give myself a hernia or DVT or something. Fruits Basket Volume 3, I am enjoying this series very much so far, but I hope that when I read this next volume I won't be either a) really miserable or b) off my face on caffiene. Reading Fruits Basket gives me bad karma, it would seem. Tokyo Babylon Volume 7; finally the end is nigh! I've been waiting for so long to find out what happens. I've also managed to be spoiled on a lot of bits, but I still haven't found out what the bet is. I really really enjoy this series; I just find it really gripping and I like to fangirl Subaru. There was nothing really 'oh my God!' worthy in the previous volume but there was plenty of 'oh my...' to keep me hanging on. So it happens that I live in one of the cities in the English speaking world, in which manga is the most easily available. It would be easier and quicker to go out and buy these books myself, but I still use amazon...because I've always used amazon to get my manga. I amaze myself with how easily I can get stuck in my ways. How is it so late in the day?! I'd better go; I've got Italians I need to be drawing! Does exactly what it says on the tin; a new page of Clematis is up. I thought that, seeing as how I draw so slowly and how easy this blog is to spam post in, I'd mention it here whenever the comic gets updated. I also bought some bed sheets from the most disinterested looking lady in Macy's. Maybe she had just had a premonition that she was going to win the lottery and that she needn't bother any more at work, or maybe she just hates her job, herself and her life, who knows?! And I was informed by the lady that served me, that I could get a free bar of chocolate, which I did! The lady at the Lindt shop was so nice and friendly, she should go to Macy's and give the other lady some pointers. But I suppose it is a lot easier to be cheerful if you spend your life surrounded by chocolate, rather than towels (chocolate towels on the other hand, I've no idea how that would make one feel). I think that now I have these chocolates, my life is complete. Best chocolates in the world. Seriously. You see, Hershey's isn't too bad (it's only a little nasty) and you can get Cadbury's here too, but they just pale in comparison to these truffles. If you have never had them before, I urge you to rectify that. I have only had one so far today, but it has put me in a wonderful frame of mind. Now I like chocolate, but I'm not normally an 'OMG I love chocolate it's the best thing ever!!!!' kind of person, but these truffles are just like pure endorphines wrapped in shiney paper. Linda phoned me this morning. And that made me happy too, I don't think I've spoken to her since I got here, and she's been living in France since almost forever. I can't wait until October when we all get to live together again in a big fun house (possibly with a tumble dryer, but without Pat Sharp). Watch as I spam my own blog! I've been finding bits of useless on the interweb. You need to watch the music video. It goes on for a bit too long, but yay for Tolkien, yay for gangstas, and extra yay for Times Square. It reminds me a bit of the mighty boosh. I had an interesting day on Sunday. It was Matt's birthday, and his family came to visit, and they allowed me to tag along with the celebrations (which was jolly nice of them). I ate my first subway (since I've been here) in central park. It was nice until the rain started. And so we decided it would be better to walk along 5th avenue, perhaps we were wrong, because it seemed to be more rainy there. One thing I noticed though. There is a Lindt shop along 5th avenue. How did I not realise there was a Lindt shop along 5th avenue?! I really have to go now and see what I can find. I hope they sell those chocolate truffles that I like so. They're not expensive, and come in a red box, and are the best chocolates evar! No really, they are! Little melt in the mouth, make you forget everything else, moments of joy they are. Man, I want to buy some now. Back to Sunday, we had a meal in the Boat House in central park. It seemed quite posh there, more posh than I'm used to certainly. I had the pasta and the monk fish, and nice it was too. And then, because the sky was clear, even though it was night time, we all went for a trip up to the top of the Empire State building. For some reason my brain keeps wanting to call the Empire State building the Eiffel Tower. I have no idea why, but it has happened so many times now, that I might just give up and call it that from now on. Anyway, the Empire Tower was cold up top, but the views were lovely. I have decided, that out of all the buildings that there are in New York, the Chrysler Building is my best. It's really pretty, I get a bit captivated by it. Soo...the Eiffel State Building hasn't been the most memorable place I've visited here *shock* but it's pretty cool, and they have a nice art deco montage going on in the lobby, and they have jolly fast lifts (elevators). On Sunday I also went in my first yellow taxi. Woo! I've realised that somehow I've come up with the notion that it's really romantic to be a taxi driver in New York. It's just that, to spend your day driving up and down the grand avenues of the city, sounds like an amazing thing to do. And then the taxi we were in nearly drove us into a fence. But he didn't, so it's ok, my notion is still intact. Hey, at work today I've been listening to a Latin music radio station. I've realised that I really enjoy Latin music. It's so hard not to dance along when at work though. I especially like merengue because, man, it's like a party in my head. Samuel Pepys - CCS CLAMP crossover?? Umm...your guess is as good as mine. 9th. Up betimes and to my office, and busy all the morning. At noon to Sir W. Batten's for dinner, where a great number of people I did not know. Among them, Mr. Reade, a Chinese man, only the second I did see in my life. He had a strange manner, but spoke English without fault nor accent, such that, if I were not to look upon him, I would have thought him to be English himself! When we told him of such, he informed us that his father was an Englishman, which I find to be a very odd thing. By and by we fell to the singing of songs and the making of music, I upon the fiddle. At our request, Mr. Reade sung for us a Chinese song, he sung it well, though the song was not to my liking. And so we, mighty merry, until late. Once again; it worries me how quick I am to forget my oath against the drinking of wine. It's not AU, it's canon! Well it could be, a little, if you squint your eyes and tilt your head a bit. How old was Clow anyway? Yesterday, in an attempt to get some culture; I went with Mariya to the Met. I thought it was just going to be an art gallery (silly me). It was more of a museum of ancient artifacts from all over the world. It was really interesting. Sadly, there was no way near enough time to see it all, but that means I'll just have to go back. There was an asian section, a greek section, a medieval europe section...it was great! In the egyptian section (which was huge), they had an Egyptian temple. An actual Egyptian temple! It looked very cool. I always get really amused when I think about things like that. There is an actual Egyptian temple, from Egypt, sitting in New York! Oh, the arrogance of the old days, when people would see things (say, a temple for instance) and just decide to take it for themselves! In the British National museum they've actually got one of the statues from Easter Island. Of all things! To take a statue from Easter Island because it'll make an interesting part of your collection! I'm just astounded by the gall of people back in the day to blatantly steal things. I have no idea how they got away with it. Other things of note in the museum were some reproductions of 17th/18th century rooms which were really pretty and a chanel exhibit with some gorgeous 1920s dresses. There was also a small (gold?) statue of a horse from 17th century Germany I think. It was really ornate but it was acutally clockwork so the horse would move around. And they used it for (wait for it) drinking games! The horse is hollow and would be filled with alcohol, they would then wind it up and let it run around the table, whoever it stopped in front of, had to drink to contents. Who knew statues could be so cool?! 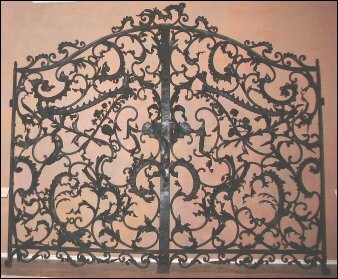 There were also some lovely ornate gates that I had to take a photo of. After the museum we were going to go have dinner in an Austrian cafe, but they were having a function there so we couldn't. We went to an Indian restaurant instead, which was nice, because I haven't had Indian since I've been here and it reminded me of home. But of course, I hadn't eaten for ages and so when I did finally eat my stomach was in a mood and gave me pain, but the food was nice. Shall we go back in time? But first things first, a quiz! What? You're telling me you haven't read Babochka yet? Why ever not? Shall we move on to the bulk of this post? Come with me now on a journey through time and space, but mainly just time. I shall now post about what I was going to post about nigh on two weeks ago when I was aghast to find that I could no longer find my site therefore having to hold in what I was going to post about until I had a place to post it, which is here, which is what I shall now post (what I was going to post before that is). I don't really know why I managed to hold it in and not forget it until now, but be careful folks when holding things in for large amounts of time (like say two weeks) because you might end up with a urinary tract infection, not that I have a urinary tract infection or have ever had one, but it could happen, and it could happen to you. So you must be careful not to hold things up inside for too long but let things go sometimes and let them be free, for your health. But don't let them loose for too long or they might fly away towards the bright lights in the distance and you might never see them again, but at least you won't have a urinary tract infection. I have completely lost my train of thought. Ah! What I wanted to say way back when, was that I had been looking around at some Franz Ferdinand photos and I saw this picture. I had seen the image before, even further back in time but had not considered it any further since then. But all of a sudden it struck me that there was a striking resemblance to this picture (from here). What's going on!? 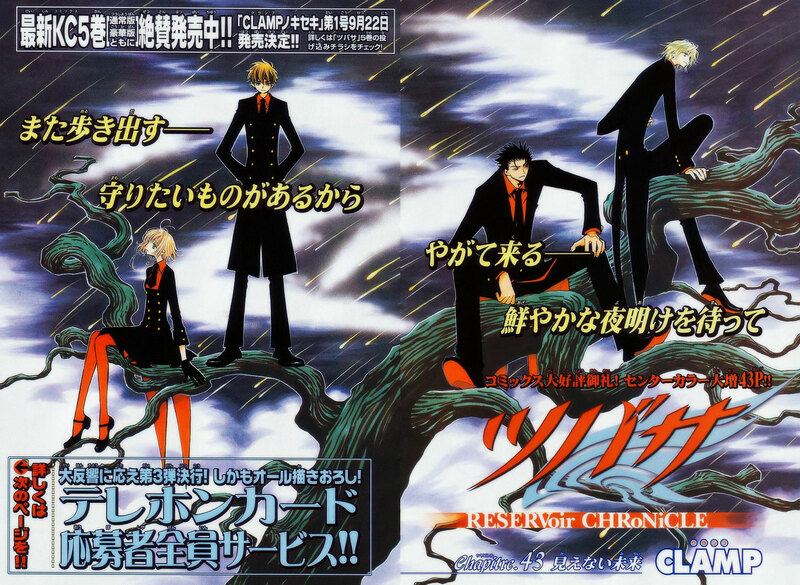 Are CLAMP designing Franz Ferdinand's clothes? Are Franz CLAMP in disguise? Is CLAMP Franz Ferdinand in disguise??? The mind boggles. Or is it because it's really not that rare to have the combination of black suit, orange shirt and this is just a coincidence that I have happened upon. Although one must keep in mind that there are no coincidences in this world! Fai: Could be the frontman, he's got what it takes, just look at his hair. What I mean is that he's probably not too bad at singing (because it's a lot like saying magical chants or something) and he's got the charisma for it. But I think that Fai would chose to stay out of the limelight, he would be the roadie that packs up all the stuff and cheers the band on from the sidelines. Sakura: Would then take the lead singer role. I'm not really sure how good she is at singing (Tomoyo was always the one that sang after all), but I'm sure she couldn't be too bad. And in Tsubasa especially, she's got this kind of inexplicable charm and good luck which means that the public would adore her. Syaoran: Would play lead guitar. He'd actually be quite good at it, but he'd be very quiet and humble about the whole thing and let Sakura take centre stage. Kurogane: Would play base. He would loom in the back, scowling. He wouldn't admit it, but he'd probably quite enjoy it. And Mokona: Would play the drums! And this is the only reason I wanted to post this here because it fits so well. I can really see Mokona playing the drums and being really enthusiastic. It just makes perfect sense in my mind and makes me laugh. And at the end of each set he would throw his drumsticks in the air only to have them accidentally land on Kurogane, every time. Yeah, I feel quite bad about the way this whole messy situation has transpired (it seems messy to me at least). You see, much like you may have done, I went to visit Schism (that's my old site) one day, and it wasn't there. Just like that, gone! So I fumbled around my old host (graffiti.net) to try and find out what had happened. And it seems that they had changed everyone's URLs to a much longer more annoying URL (and the old one was annoying). But what really got my goat was that they had never informed us about the URL change, not even after it happened, unless you went and asked them yourself. Very poor show. Now, I understand that they may just be having some problems their end and so they didn't know that the URLs would change either, but I shall be stubborn and assume that they didn't because I was given absolutely no eplanation of why it had happened, just that I had to use a new URL from now on. If I think about it though, I don't have any right to complain, after all, it is a free service. And it may be very a bit clunky but they provided free hosting with no adverts! Now that is a rare thing indeed. So it was good while it lasted, but I think it was time to move on. I've had a website for...I think *counts on fingers* five years now, and it's jolly well about time I actually forked out some money for it. Not that I really have much stuff to put in this domain, but look how shiny it is! Man, paid webhosting is leagues above free webhosting (and so it should be). I actually get the feeling that the people that host me (hostony.com) actually want to have me there, rather than put up with me until I stop hanging around. I could get used to it. I'm not sure I could get used to spending the money, but dollars are so much easier to spend than pounds! So, the new layout. I think part of the reason I bought this domain was because I wanted to make a new layout. More specifically, I wanted to make a layout featuring Franz Ferdinand! I. Think. Franz. Ferdinand. Are. Awesome. They really are! I love all of their songs. I have recently been very much into 'Shopping for Blood', hence the 'I taste of nothing' tagline. All in all, it seems a bit pretentious, I like it. Although one day I will learn how to make more exciting layouts. Er...my domain also came with it's own lovely forum, so I thought I'd make use of it (there's a link to it up there in the menu section). It replaces that tired old message board that I used to have. So feel free to use it, you don't have to log in to post I don't think, but you can if you want. Of course, if no-one uses it, I can roll around it and talk to myself. I decided that as I was moving on, so to speak, by buying a domain, that perhaps there were some things I should leave behind. I always had the nagging feeling that people didn't like nor understand Moo's presence. I thought that maybe I should remove Moo from the site because she just made it more annyoing. However, as soon as I even contemplated this idea a whole argument between myself and Moo rose unbidden in my mind. She came across as very strong-willed and determined to stay, as anyone would if they were facing the end of their existance. So I caved in and she can stay. I'll be reducing her involvement in blogging, but she'll turn up every now and again. It's odd, I'm quite certain that Moo is not real and yet she seems to have developed a life of her own over the years...Or maybe I'm just too fond of her to let go. What do you think? Should I keep Moo around when I blog like I used to? Or should I just let her simmer in the background? And one final thing to this really really long post. I was thinking that maybe I might like to draw a doujin. Not one to actually publish and sell, but just a short story to put on the internet. If I did, do you have any ideas on the fandom I should chose? I was thinking maybe LOTR, but it would have to be the Silmarillion because the trilogy itself seems to be too complete for me to add any more. And I think maybe not enough people have read the Silmarillion to be interested. Of course this is all just speculation at this point.